Tears before pearls: Drumkit update. Hmmm...I have apparently won the drumkit but no reply to the two emails sent to the seller. I am hoping the seller is out at work or too busy to reply,but I have a thirteen year old bouncing off the walls and ceilings because the kit is not here NOW! We'll see how things turn out. 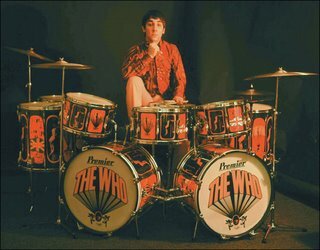 I can only hope No.1 has the talent and passion for music without the madness and insecurity, or the passion for booze and drugs.He has always wanted to play the drums and he did briefly have a small toy kit as a six year old until the little psychopath next door broke it. The common perception of drummers is that of the lunatic, the animal or the monster at the back. No.1 seems to have his feet firmly on the ground and I am more than happy to support him in drumming. However, I may need to put down a couple of thick rugs and soundproof the walls...eggboxes are supposed to be good. I can just see Mrs.C agreeing to eggboxes on the walls in a nice shade of pink. 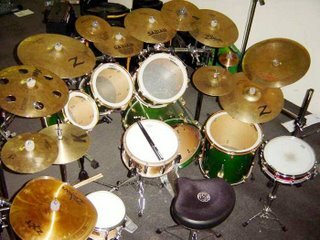 However, No.1's desire to drum and his love for metal music (death, thrash, whatever it is called today) may prove interesting....We may need earplugs!Or better yet, a large shed but the danger is that'll attract a band to practice there. This is the sort of kit No.1 would like. I finished the autobiography of John Peel and miss the man more than ever. Truly an original and too few of them on the radio these days. Johnny Walker comes close and I do like Mark Lamarr, but Jonathon Woss...no. I tend to dip into various radio stations, mainly BBC 2, 3 and 4. Also local stations and folkwaves on Monday evenings, as well as Talksport.As I write this I have 'Listen again' and Zoe is talking about her blog. It's worth listening to a few of the bloggers although hearing them might disillusion the carefully crafted mental image one has built up of the blogger.